The number one way to make money in pro wrestling is with a great feud. Nothing draws bigger at the box office than an exciting rivalry pitting good vs. evil. Some rivalries are based on hatred, some are based on championships, and some are based on nothing more than a motivation to be the best. Today I spotlight one of professional wrestling’s greatest feuds. Dusty Rhodes vs. the Four Horsemen was undoubtedly one of the greatest feuds in my lifetime as a pro wrestling fan. I was fortunate enough living in Philadelphia, PA to get NWA Worldwide Wrestling here in 1984, just in time to see all of the chaos and drama of this great rivalry. While Dusty would feud with several incarnations of Horsemen, it was his first go-around with the original group that is most memorable. Dusty was an icon and the top babyface of the Crockett territory, yet he was a man without a rivalry. 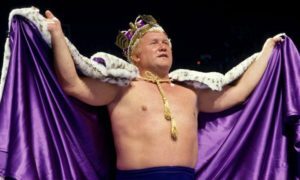 Rhodes and Flair had simmered out when Flair turned babyface to feud with the Russians and Tully Blanchard, while Dusty had just started feuding with the Andersons and Tully Blanchard, yet neither feud had really kicked into gear. Unfortunately with Rhodes, Flair, and Magnum TA on the cards, the territory was desperate for a top heel. Nikita Koloff was too green and Tully was perfect in his spot, yet wasn’t the kind of a wrestler you’d make your top heel. He was ideal for his spot as second heel from the top however. With Vince McMahon continuing his expansion, the territory needed an answer quickly. Nothing made more sense than going back to its best heel, Ric Flair for that top spot. Everything changed on September 29, 1985 in the Omni. The angle that kicked off the Horsemen was new, dramatic, and printed money overnight. The set up was simple yet a little complex. Flair as finishing his feud with the Russians and had just defeated Nikita Koloff in a Steel Cage Match in the Omni. The Russians attacked Flair after the match. Dusty ran into the cage to help Flair and fend off the Russians. An angry Flair had words with Dusty once the Russians were gone and was irate that Dusty got into his business. The Andersons came into the cage and attacked Dusty as he and Flair were arguing. Flair joined in, and together they had the Dream cornered, 3-on-1 in the cage. The fans were shocked, Dusty was shocked, and with the cage door locked, Flair injured Dusty’s ankle and solidified his turn. The angle was somewhat reminiscent to the historic GCW angle where Dusty and Ole teamed up to take on the Assassins with Ole turning on Dusty, creating a 3-on-1 situation inside of a cage. So where did Tully come into play? Tully was wrestling Sam Houston when the Andersons came into the ring. The three villains attacked Houston, who had escaped an attack from Flair and the Andersons earlier. This was seen as something of a message being sent to Dusty. The Andersons, Flair, Blanchard, and JJ Dillon started appearing on interviews together and organically the four were paired together and the Four Horsemen were officially born. Attacks from both sides were occurring on a weekly basis. Dusty was able to get one up on the unit when he, Magnum TA, and Ron Bass attacked Ole in a 3-on-1 situation. Magnum and Tully paired off and exchanged the U.S. title in a number of bouts. Dusty would team with several babyfaces to take on different factions of the Horsemen. Arguably the most memorable angle of the feud came when the Horsemen used a home video camera to tape an assault on Dusty with a baseball bat. The Horsemen followed Dusty out of the ring and cornered him in a parking lot, attacking him with the bat, while JJ Dillon taped it. Ironically this is probably more memorable to most fans than the actual angle that kicked it off. Dusty was able to extract revenge on the house shows with numerous wins, but the big one was just ahead. The feuds were red hot by the time they got to Starrcade with Magnum wrestling Tully in a historic I-Quit Match and Ric Flair defending the NWA title against Dusty Rhodes in the headliner. Unfortunately Magnum suffered a career-ending injury which took him out of the ring and was replaced in Dusty’s army by Nikita Koloff. 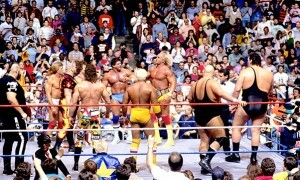 Dusty and Nikita teamed against different pairings of the Horsemen, notably Tully and Flair on house shows. I remember seeing many matches between Dusty and the Horsemen at the Philadelphia Civic Center. Dusty would have singles matches with all of them and wind up teaming with everyone from Ronnie Garvin to Wahoo McDaniel to Jerry Lawler to the Road Warriors. Dusty traded titles with Arn Anderson and Tully Blanchard but it was than a year into the feud before he would unseat the NWA world heavyweight title from Ric Flair. Rhodes defeated Flair in a Steel Cage match at a Great American Bash to win the title, yet the title reign only lasted 14 days. The Horsemen attacked Dusty two days before the match in St. Louis, M.O. and injured Dusty’s leg, yet Dusty wrestled anyway. Flair wound up pinning Dusty in St. Louis to regain the title after Dusty was pinned while in the figure-four leg lock. Dusty was out for revenge! Dusty would get his revenge on the Horsemen, targeting Tully. Dusty promised to take matters into his own hands and he did. In Greensboro, N.C. Dusty wound up taking a chair and pounding it into Tully’s leg. Dusty then put him in a figure-four leglock, grabbed the ropes for leverage, and held on to injure Tully’s leg. The Midnight Express of all people ran out to help Tully but they were cut off by Magnum TA. This was a fantastic angle and great continuity to the story to keep the feud going. I don’t think enough is said about Dusty’s continuity as a booker during this feud. Everything made sense and everything that happened had a cause and an effect. Unlike the WWE today where you see Chris Jericho’s knee injured one week and he’s fine the next week, everything was tied together during this time. This feud was so exciting because it was just one big story with all kinds of twists and turns and a ton of history by the time it ended. It was the greatest roller coaster in pro wrestling at the time in my opinion. Dusty wound up moving away from Flair shortly thereafter and into a bloody battle with Tully Blanchard over the Television championship. The series peaked at Starrcade 1986 where Tully defeated Dusty to win the TV title in a First Blood match. The feud continued all the way into the summer with the two feuding over a $100,000 bag and the title. The two had incredible chemistry and I remember seeing some tremendous matches between the two at the house shows and later on tape. Of course I can’t do a blog on this classic rivalry without mentioning the War Games. The first-ever War Games pitted Dusty and five allies against the Four Horsemen and their manager JJ Dillon. The rivals had two War Games matches over the summer, the first of which saw Dillon finish the match with a broken arm. To Dusty’s credit as a booker, he always seemed to find a way over two years to keep the rivalry relevant whether it were matches against Tully and Arn over the television title, matches against Lex Luger over the U.S. title, matches with Flair over the world title, or six-man tag team title defenses with the Road Warriors against three members of the Horsemen. I think the feud peaked after the Barry Windham turn. Dusty and Windham never got off the ground like I would have expected. I think fans were just tired of seeing Dusty against the Horsemen. It’s funny because as great of a booker as Dusty was, he never seemed to have an out. Ironically enough, a lot like Hogan vs. Piper in the WWE which rivaled the feud in the earlier years. He also continued to let the Horsemen run wild at his expense in the storylines. Dusty and Flair went their separate ways with both eventually leaving the company and working for the competition over the next few years. It is hard to encapsulate how exciting this feud was in a blog. There were countless interviews and angles done over two years that had fans on their feet and excited more. Like most great wrestling angles, it just seemed to burn out a bit towards the end. Yet for fans like me who were able to live this on a weekly basis via syndicated shows, house shows, or TBS television, it was truly one of the greatest pro wrestling feuds in history.